When you have children, planning a family vacation takes on a whole new meaning. There are many things to consider when taking a family vacation with children, especially where to travel. Take your next family vacation to Cancun, Mexico, and you’ll be pleasantly surprised at how enjoyable and accommodating it is for both you and your children. Before scheduling your Cancun vacation, one of the first priorities is getting passports for you and your children. Regardless of age, all U.S. and Canadian citizens traveling to Mexico are required to have a passport. As a U.S. citizen, if you travel by land or sea, you can get a passport card, which is more affordable. A passport book (more comprehensive) is required for air travel and can also be used for all other methods of travel. One of the nicest things about traveling to Mexico with children is how welcome your children are here! Life in Mexico centers on the family, so children are very important. Mexico even has a holiday for children, Dia del Niño (like Mother’s Day and Father’s Day), on April 30th, when children receive presents and special attention. Establishments like restaurants, most vacation attractions, many hotels and resorts, and almost anywhere you go (excluding nightclubs, of course) will welcome children with open arms. Many restaurants have children’s menus and some of the chain restaurants even have child play areas. 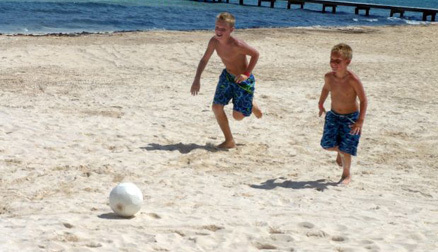 Since traveling to Cancun, Mexico, can be an educational and active experience, children age six and above will benefit the most from a vacation in Cancun, Mexico. Many of the vacation attractions and travel activities are better suited for older children, such as the ancient Mayan ruins at Chichen Itza, sightseeing trips by car and by boat, and nature parks like Tres Rios, which older children are more likely to enjoy. There are many vacation attractions and travel activities for children in and around Cancun, Mexico, such as the Caribbean beaches for swimming and snorkeling, Nichupte Lagoon for boat rides and tours, Xcaret eco park, and Xel-Ha eco park. Here are a couple other family friendly places your children may enjoy. Aquaworld is the largest water sports and marine fun center in Cancun, offering water sports lessons and jungle tours, submarine rides, jet skiing, snorkeling, scuba diving, fishing, parasailing, dinner cruises, and tours to Isla Mujeres and Cozumel. Fees are priced individually based on your choice of activities. Aquaworld is located in the Cancun Hotel Zone on Boulevard Kukulcan, kilometer 15.2 and is open Monday through Sunday, from 7:00 a.m. to 10:00 p.m. Contact information is (998) 848 8327. Wet‘n Wild, the only water amusement theme park in Cancun and the Riviera Maya, offers family activities on 18 acres of land and 800 feet of white sand beaches. Enjoy water slides, water chutes, toboggan rides, children’s play pools, scuba diving and snorkeling lessons. Wet‘n Wild also has an interactive play park for small children with lifeguards on duty. Located at the end of the Cancun Hotel Zone on Boulevard Kukulcan, kilometer 25, in Parque Nizuc, Wet‘n Wild is open from 10:00 a.m. to 5:00 p.m. The entrance fee is approximately $650 Mexican pesos ($49 USD) per adult, $570 Mexican pesos ($43 USD) per child from age 3 to 11 (children under age 3 are free). On Sundays, the fee is $20 USD for everyone. Contact information is (998) 881-3000. Affordable hotels and resorts are especially important when taking a family vacation with children. Check out some of our affordable family friendly resorts and hotels.